Considering WayForward’s history with licensed games, you’d think it would have been the perfect studio to bring Cartoon Network’s Adventure Time series to life on game consoles. (Hell, it already made a solid outing with last year’s Hey Ice King! Why’d You Steal Our Garbage?!! for the 3DS.) Alas, WayForward’s second Adventure Time title, Adventure Time: Explore the Dungeon Because I Don’t Know!, is a lifeless dungeon-crawler that’s simply a chore to play. It shows a surprising lack of imagination, particularly for such a renowned studio, wrapping the zany Cartoon Network series over a tedious adventure that does neither the cartoon nor the genre any justice. Unlike the studio’s previous stab at the license, Explore the Dungeon trades in Zelda-style gameplay for straight dungeon-crawling. Players will spend the entirety of the adventure delving deep into the randomized bowels of the Secret Royal Dungeon, where all of the Candy Kingdom’s worst criminals are locked away. When the criminals inexplicably escape, Princess Bubblegum summons Finn and Jake to explore the dungeon and find out the reason they were able to break free. 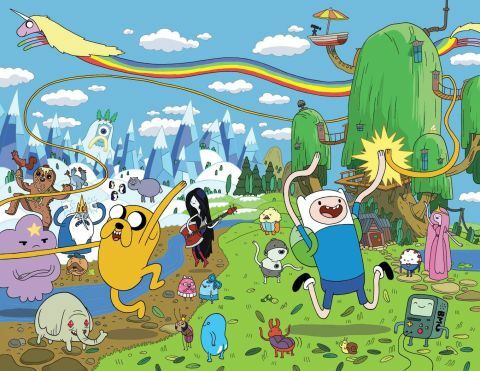 The story is predictably silly, but it serves its purpose of giving you control over all the series’ favorite characters, including the aforementioned duo, Marceline, Ice King, Cinnamon Bun, and Lumpy Space Princess (among a handful of others). The best part about this robust selection is that each character is voiced by the cast of the cartoon, infusing the game with the series’ quirky humor. Characters will frequently spout off ridiculous one-liners in the middle of the game, which are typically hilarious and do a great job of channeling the spirit of the cartoon, especially LSP’s quips, which naturally make reference to her…curvaceous figure. (I dare you to keep a straight face when she yells, “Hands off my hot, lumpy body!” after taking damage.) The rest of the presentation isn’t quite as strong, particularly the muddled visuals, but the voice acting will frequently leave you in stitches and is the game’s biggest highlight. Unfortunately, the gameplay doesn’t come anywhere close to matching the charm of the voice work. As with other rougelikes, you’ll be spending the better part of your adventure exploring a randomized dungeon, which is divided up into 100 floors. While that may sound like a significant amount of content, you’ll soon realize that the dungeon is divided up into 20-floor segments, each of which adheres to a specific theme. That means you’ll be exploring the same generic tunnels and fighting the same enemies over and over to the point of nausea, making the game a slog. To make matters worse, you can only return to the surface after every five floors, so if you happen to lose all of your health before you reach the next checkpoint, tough luck--you’ll be dumped back above ground without any of the loot you’d accumulated. Worse still, there’s no way to quick-save in the middle of a floor, forcing you to continue playing until you reach the next checkpoint (or die trying). It’s a bit baffling that WayForward decided to go this route with its second Adventure Time game, as the unforgiving nature of the genre stands at odds with the fun and whimsy of the license. Four-player co-op does help remedy some of this tedium by allowing you to revive downed teammates, and exploring with friends is certainly preferable to going it alone. But even with three partners, there’s not nearly enough variety in the game’s settings and challenges to sustain your interest for long. What makes the game especially frustrating, though, is the lack of any kind of map. Because only a small portion of the floor is visible at a time, it’s very easy to lose track of where you’ve already been, and you’ll often find yourself retreading the same ground in search of the next exit. Having access to a map, especially on the Wii U GamePad, which isn’t used for anything other than displaying BMO’s admittedly adorable face, would have made navigating the dungeon considerably easier and taken much of the frustration out of the gameplay. But as it stands, the lack of a map is a significant oversight that makes an already tedious game even more mind-numbing. It doesn’t help that combat grows monotonous very quickly as well. Despite each character’s unique traits, all of them control similarly, so you’ll be using the same battle tactics--smacking an enemy in the face with a sword--regardless of whom you choose. Combat isn't entirely mindless; sub-weapons and special attacks add some variety to battles. But even with these wrinkles, you’ll still spend the majority of your time simply mashing the attack button to beat your way through a floor, making the gameplay a never-ending stream of shallow ideas. Even without last year’s solid Adventure Time game to compare it to, Explore the Dungeon is a monotonous dungeon crawler that’s redeemed only by its use of the Adventure Time license, and even then not nearly enough to recommend to fans of the series. If you’re looking for a way to explore the surreal and whimsical Land of Ooo, WayForward’s previous take on the series does a much better job. This game, however, is bunk. This game was reviewed on Wii U.